A signed, limited edition digital print (100 in total) taken from an original artwork in mixed media. 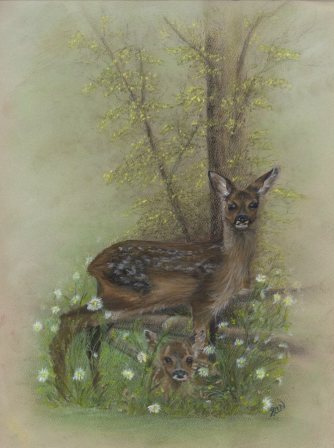 Showing a lovely misty woodland, as two deer, one standing proud, the other sitting in the long grass and wildflowers. A broken old fence is between the deer and woodlands, but they are so peaceful and beautiful, enjoying their tranquil surroundings.